Valentino is looking to add a little glamour to your next trip to the mall with its new handbag line. 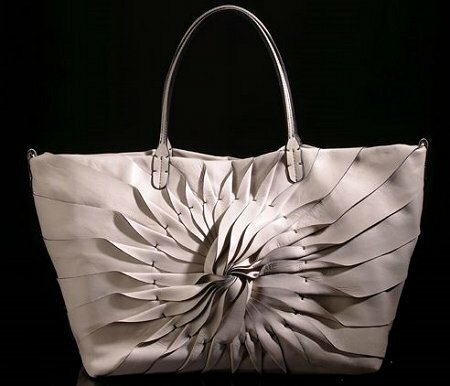 Acclaimed designers Maria Grazia Chiui and Pier Paolo have created 10 different purses for the Shopping Couture collection. Each beautiful bag has a style all its own. Rock and roll studs and colorful peacock feather accents complement signature Valentino Haute Couture embellishments like roses, embroideries, and ribbons. I've fallen for this Soleil tote with its richly textured pleated leather creating a fiery sun. It reminds me a little of the iconic Maison pintucked purse, but the design is even more striking. Could Valentino have another "It" bag on its hands? The first of the Shopping Couture luxury tote bags will hit Valentino boutiques and Neiman Marcus stores in late November, just in time for Christmas. We'll see a few new ones released every couple of months through to April. You'll need to save your pennies though. Prices range from $2995 to $5895.